I am thousands of kilometers away on a Witness for Peace* tour in the northwest Pacific of the United States. In order to arrive, I spent 18 hours traveling through airports on four different flights. I had that time to reflect on the long bridge that many people have constructed over time. A solidarity bridge that breaks through the dynamics that governments use in their relationships, the powerful dynamic that crushes the weak, the dynamic of the large intervener to the small and the small being servant to the empire. I know that I’m speaking from privilege. I am traveling to the United states with a visa when every 15 minutes, a Honduran migrates undocumented to this country. I do it because I can speak about what is happening in my country from the position that I hold as a journalist. To be a channel for the voices who don’t have this privilege not only challenges me, but more than anything, gives me significant responsibility. I am here, well in the North, just a short distance from where the presidents of the Northern Triangle will be meeting to talk about the failed Plan for the Alliance for Prosperity, the plan that has erupted in the face of the United States or rather, on its border, that’s inundated with migrants fleeing from Central American countries, yet they are far away from prosperity. It’s here, in this place surrounded by mountains with pine trees, lakes, large rivers, and extensive valleys, where the cold not only freezes my nose, but also the dreams of thousands of migrants. Dreams of them living a dignified life. Dreams. To come here is to talk of dreams, of a country that we dream about but that really isn’t a dream country, of a life that isn’t real. I began this trip in a city called Coeur d’Alene – the heart of the owl in the original native language – in the state of Idaho. The Human Rights Education Institute and later Whitworth University organized, along with a few community cultural and political activism projects, the events where I spoke about independent journalism in Honduras. There we also talked about the memory that we’re missing, the identity that we’re searching for, the citizenry that we intend to form through journalism with Contracorriente. Here, thousands of kilometers away, there were several people listening, asking, and thinking about actions they can take. How we can strengthen the solidarity between people, who also feel crushed by corrupt, racist, patriarchal systems that benefit the elite and that devastate everything in their path. In these cities, the people who attended where mostly US-citizens. Even in the class called Latinos in the United States, there were no Latinos in attendance. The percentage of migrant Latinos in these first few cities is minimal, as is similar with the Black population. Nevertheless, yesterday we arrived in the state of Oregon, which has had a sanctuary law for 30 years, but which could be repealed in the upcoming midterm elections of November 6th. This initiative is called Measure 105, and it was presented by three republican legislators who are hoping that the law established in 1987 will be eliminated. In theory, the law establishes that local governments cannot use their resources to enforce federal immigration laws if the person’s only crime is living in the United States without documents. This is where the immobilizing ICE storm blows in. In Oregon, despite being a sanctuary state, one county jail called NORCOR has contracts with ICE (Immigration and Customs Enforcement). Thus, immigrants detained by this State Department entity arrive to the small jail of NORCOR, despite the fact that the state of Oregon has a law that does not permit support for antiimmigrant processes. 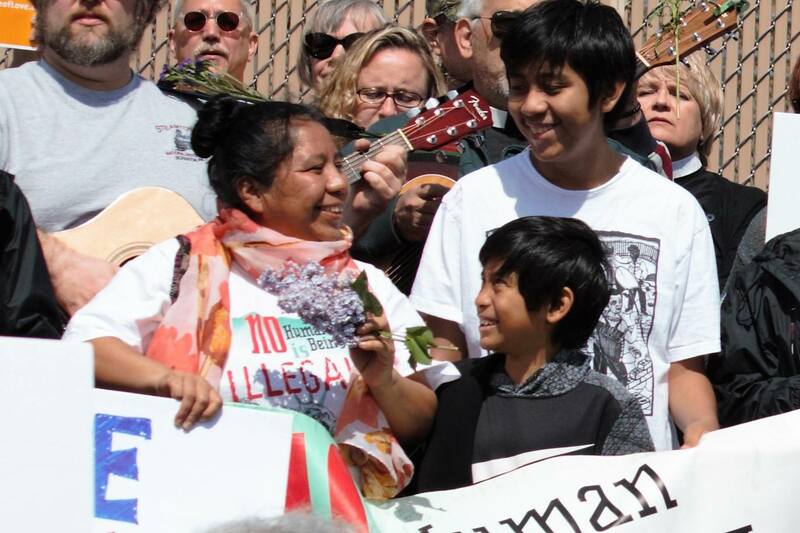 The arrival of around 30 detained people, transferred from detention centers in Washington, sparked concern from activist groups in the community, who have been organizing since 2017 to take action. That is how Gorge ICE Resistance’s permanent protest began. 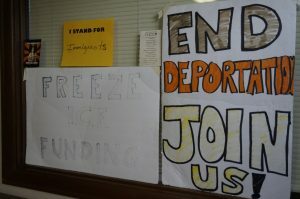 Gorge ICE Resistance is a citizen activist group in support of the migrant community that meets in a chapel in the city of The Dalles, where NORCOR is located. For 520 consecutive days, around 15 or 20 people stand protesting outside of the prison, demanding that the contract with NORCOR be rescinded, and furthermore, that Oregon citizens’ taxes stop being used to detain immgirants. According to the organization’s data, each person detained in NORCOR costs the prison between $97 and $115, but ICE only pays $90 per detained migrant. Additionally, the organization considers NORCOR to be one of the most precarious detention centers, used as punishment for migrants that are considered to be problematic in other centers across the country. These people are suing the State for violating their sanctuary law through this contract that NORCOR has had with ICE since 2014. At the same time, they are looking to raise awareness so that in the November 2018 elections, Measure 105, which would abolish state sanctuary, will not pass. But that work is not easy. Although in Oregon there is a much larger Latino community than in Idaho or Washington, the business represented by migrants in the prison industry and the hate speech that has taken hold after Trump continues to prevail. In Oregon, word began to spread about Measure 105 after an undocumented man killed two people when he ran a red light on a road in the state’s capital. This case has been used as an illustration to determine that immigrants are dangerous. Within NORCOR, the average age for detainees is 35. The majority of the detained migrants there have lived in the United States for an average of 18 years. They have spent practically their entire lives here and don’t have a country to which to return. Currently, there are three Hondurans detained in this location where family visits are prohibited. Here, migrants are categorized as people without citizenship, therefore, do not have the right to be notified if they will be transferred, they have no right to a public defender, nor a right to trial. Within Gorge ICE Resistance, they have heard about this country that is very far from these immigrants. A place where they cannot return because violence is normal, because corruption is the way of governing, because the country is only valued as treasure but its people are not. And they listen to these people that are fighting not to be deported, others are seeking asylum because their lives have been threatened. Yesterday they heard me telling them about the people who stay in Honduras, the people who think that all of these stories need to be told, that it might be useful to ask the right questions, that independent journalism might be able to help create memory, to write a story of a citizenry who took the reins of the construction of a new country. * Witness for Peace (WFP) is a politically independent, nationwide grassroots organization of people committed to nonviolence and led by faith and conscience. WFP’s mission is to support peace, justice and sustainable economies in the Americas by changing U.S. policies and corporate practices that contribute to poverty and oppression in Latin America and the Caribbean. WFP is currently pushing the Berta Cáceres Act, a law that would halt security aid from the US to Honduras until human rights violations committed by Honduran state security forces against citizens are investigated.